I don’t know about you, but I have two types of stores that I could literally live in (while handing over my full paycheck in exchange for goods!). Kitchen stores (ie: Sur La Table) and spice stores (ie: Penzey’s). And the funny thing about spice stores is that I don’t even really need to be on the lookout for a spice to spend a good half hour in this olfactory heaven. I just glance at the spices available, and the recipes that they generally display to get your creative juices flowing. So last time I was at Penzey’s, I spotted a recipe for Molasses Cookies. At first glance I thought to myself, not sure I have ever made those and it has probably been since childhood last time I tasted them. 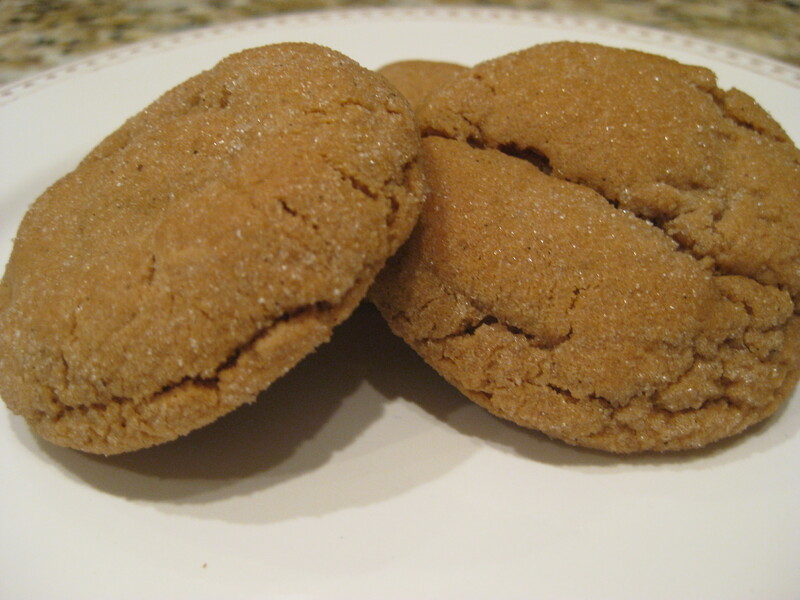 But, I started thinking that a spiced cookie would be delicious in the winter – might even warm me up! This recipe is originally from Linda Aukerman and to my surprise, has no butter. Apparently, when baking with just shortening (vs butter) it really affects the texture of the cookie. And I have to admit, the crunchy outside and super chewy inside is worth the ingredient switch. And, combined with the warming spice mixture, make this cookie amazing. These cookies were a clear winner the minute we tasted them – or quite possibly the moment they came out of the oven and we could smell them. They also disappeared at work quite quickly. Thanks to Penzey’s and Linda Aukerman for sharing a recipe that does warm me up on a cold winter night! To the melted, cooled shortening add: the sugar, molasses and eggs. Beat well with hand mixer. In a separate bowl, sift together the dry ingredients. Add the dry ingredients to the wet ingredients, mixing to incorporate. Chill for at least an hour (can make the dough ahead and make the cookies the next day if desired). Preheat oven to 375. Using about a tablespoon of dough, form into balls. Roll in sugar and place on ungreased cookie sheets (although I would recommend a silicone mat or parchment paper), about 2 inches apart. Bake at 375 for 8-10 minutes. Check at 8 minutes. You want them to flatten but still be soft. Let the cookies cool for at least 2 minutes before removing them from the pan, as they can break if you try to pick them up when they are very hot. Cool on a cooling rack. This entry was posted on February 3, 2013 at 10:20 am and is filed under Desserts. You can follow any responses to this entry through the RSS 2.0 feed. You can leave a response, or trackback from your own site.